This is the starting lineup of our mens jackets. We have many more to add and offer. Feel free to contact us if your looking for something in particular that isn't listed on this page. Please check in often because we will frequently update this page with new items. 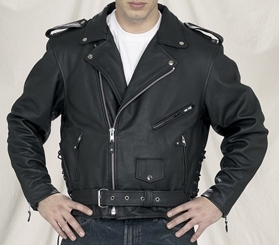 This is a very heavy duty motorcycle jacket. Fully vented with lot's of pockets. Heavy duty zippers. Includes Thinsulate liner and built in neck warmer. 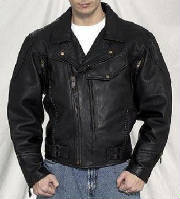 This is a high quality, all leather jacket. 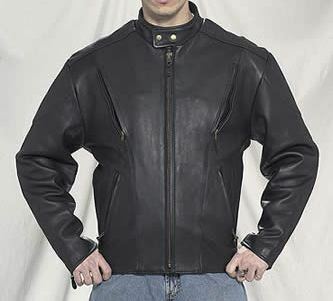 Very nice racing style motorcycle jacket. Very heavy leather. Zip open vents for warm weather riding, and also comes with zip out thinsulate lining for cool weather riding. Great jacket at a great price. 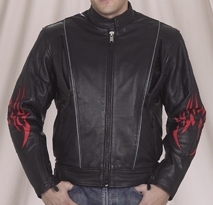 Very nice racer style leather jacket. Removeable thinsulate lining for cold weather riding, and vented for warmer days. Nice jacket at a great price. This is a nice full featured jacket in "Retro Brown". Comes complete with zip out Thinsulate lining. A real nice heavy jacket. 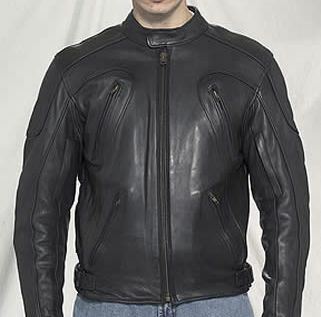 You can't go wrong with this classic riding jacket. 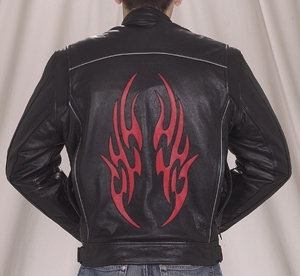 Very nice leather racing jacket with red flames on sleeves and back. Also has reflective piping. This is a nice vented jacket that includes a zip out lining. Great looks for a great price.